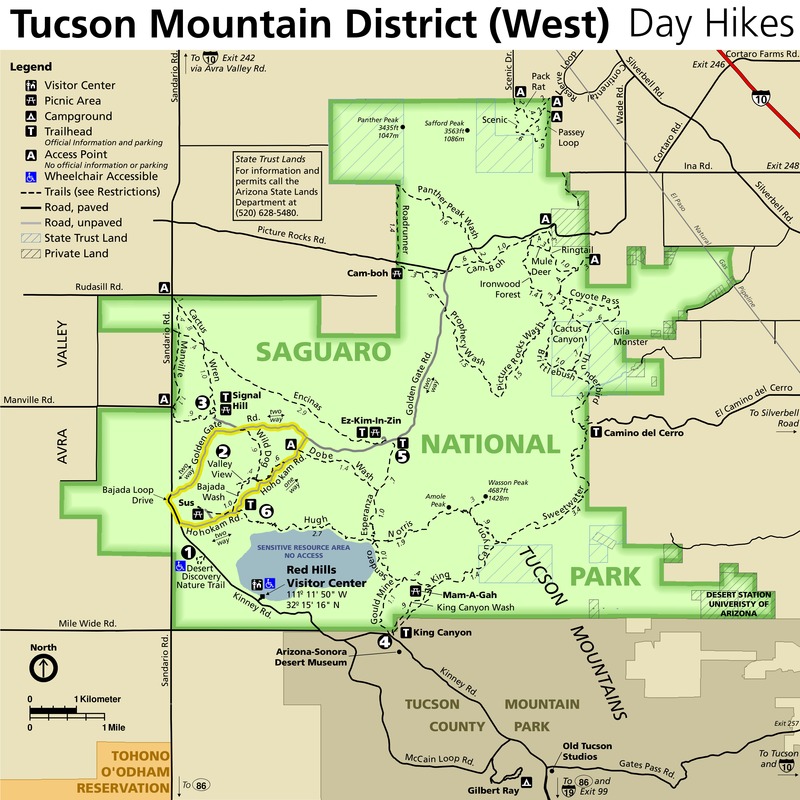 The Pink Hill Trail from the west can be reached from the Saguaro National Park Broadway Trail Head. 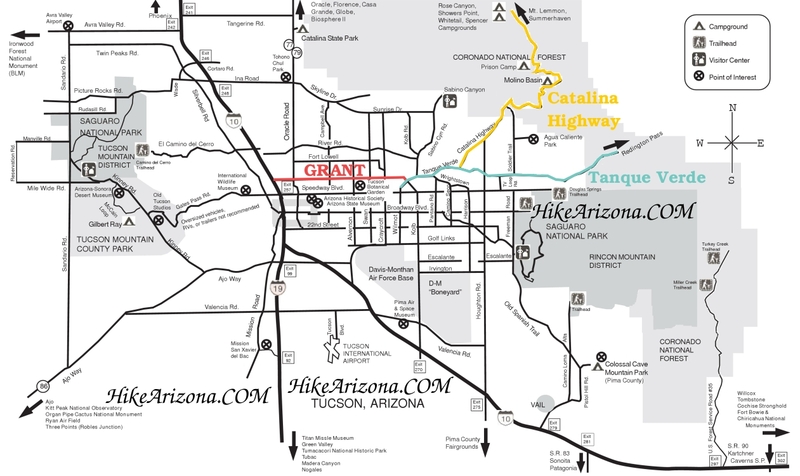 Take the Shantz Trail east for .4 miles to the signed intersection with the Pink Hill Trail. 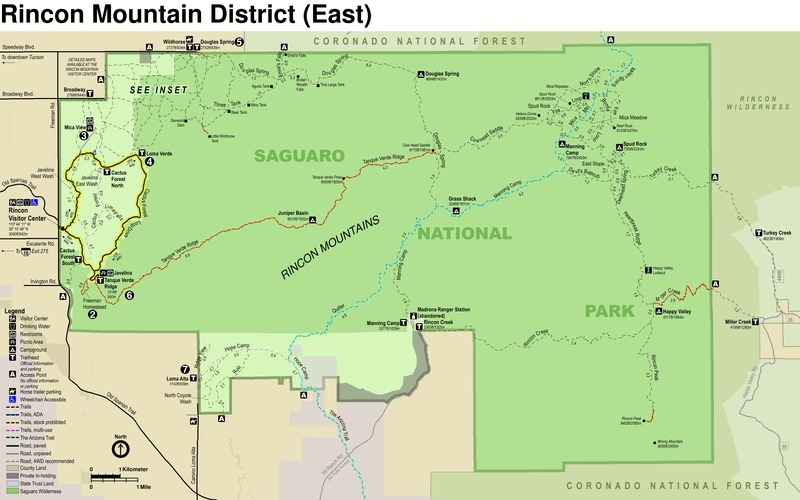 The Pink Hill Trail heads almost due east staying fairly level with very minor elevation changes at the Javalina, Loma Verde and Monument Washes. Between the Loma Verde Wash and Monument Wash is Pink Hill, a small hill 40 to 50 feet above the desert floor. The Hill is named for the Iron rust found on the sides of the hill (It didn’t look Pink to me). This hill was also called Coffee Pot Hill because cowhands would gather there for coffee while keeping an eye on their cattle below. From the signed intersection on the Shantz Trail, the Pink Hill Trail heads east along the desert floor for about .2 miles before crossing Javelina wash. Not much elevation drop going into this wash, in fact it is hardly noticeable. Javelina Wash is very wide here about 400 feet across and consists of numerous finger like streams winding their way north between Creosote Bushes. On the far east side of this stream system is the largest of these fingers and actually resembles a wash worthy of being named. There is a Sign here that indicates the junction with the Javalina Wash trail. From this wash the trail follows along for another .5 miles through the creosote, and sporadic saguaro cactus before making a subtle drop into Loma Verde Wash. This wash is rather narrow and again is signed indicating the Loma Verde Wash Trail junction. The Pink Hill Trail continues east for another .1 miles before coming to the junction of the Loma Verde trail. It appears the Pink Hill Trail ends here but the sign indicates that the junction with Pink Hill Trail East is .2 miles north along the Loma Verde Trail. About 100 yards after the signed Pink Hill East intersection there is another trail that will take you to the top of Pink hill, .1 miles and an easy 40 foot climb. From the top of the hill there are great views in all directions. Head back down the hill to continue on the Pink Hill Trail East. When you get back on the Pink Hill Trail and continue on for about 100 yards you are now just east and below pink hill. The old trail use to head straight up to Pink Hill at this point and continue west to connect up with the Pink Hill and Loma Verde Trail. This old route made the Pink Hill Trail more of a straight through shot instead of the new Pink Hill Trail that takes you along the Loma Verde Trail, skirting Pink Hill along its north side. Continuing east on the trail after .3 miles the trail drops down into the Monument Wash, the largest of the three washes. The Creosote bushes give way to the Mesquite tree at least for a while. 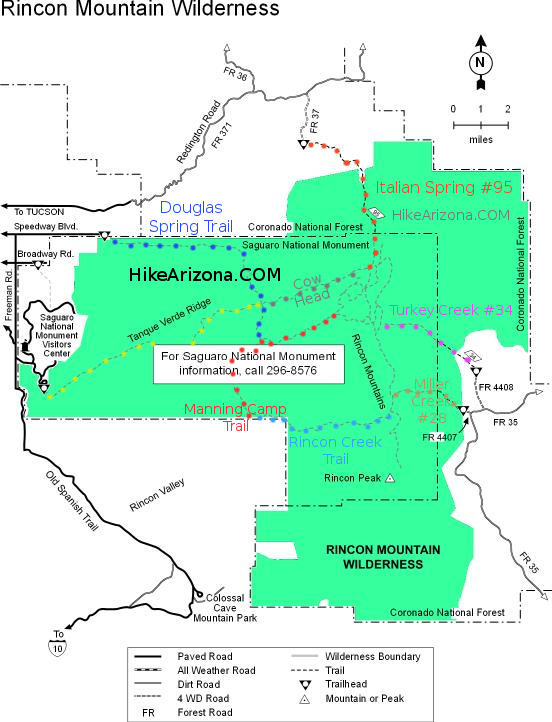 Once on the other side of the wash it is .2 miles to the Squeeze Pen Trail and the end of the Pink Hill Trail. 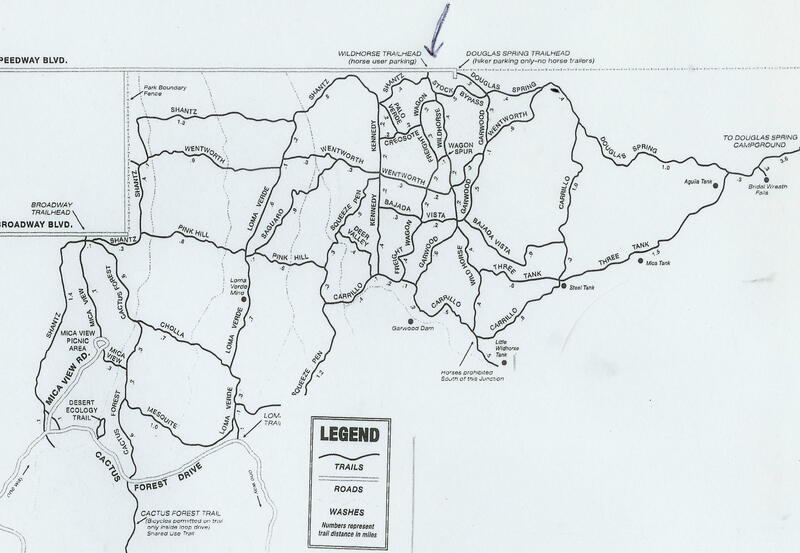 This is one of those trails done in conjunction with other trails to form a loop using the Squeeze Pen Trail to connect up with other trails to the north or south.